Set in a small town in Michigan in the midst of a snowy winter, Vanish in an Instant (1952) is a tightly plotted murder mystery in the classic hardboiled style. Its author, Margaret Millar, was a Canadian-American crime writer, best known for her 1955 novel Beast in View, winner of the Edgar Allen Poe award for best novel. If Vanish is anything to go by then that award was fully justified; it’s a very compelling mystery, full of twists and turns with plenty to keep the reader guessing right up to the very end. As the novel opens, Mrs Hamilton, a wealthy and rather bossy matriarch, has just arrived in town accompanied by her paid companion, Alice Dwyer. Mrs Hamilton is on a mission, namely to do whatever it takes to get her daughter, Virginia, out of jail following her alleged involvement in the murder of a local married man, Claude Margolis. As far as the police are concerned, Virginia – Margolis’ mistress – is the prime suspect, especially as she was found wandering about near her lover’s cottage shortly after the stabbing. However…Virginia was blind drunk at the time of the incident, and her recollections of the evening’s events are hazy at best. Even though she was discovered covered in blood, Virginia has no idea whether she actually killed Margolis or not – she may have done it, but she isn’t sure. Neither is Meecham, the bright lawyer Virginia’s husband, Paul, has hired to help. To complicate matters further, a local man named Earl Loftus appears on the scene and confesses to committing the murder. On the surface, Loftus seems to have no apparent connections to Margolis, but his account of the crime is convincing enough to persuade the police of his involvement. Virginia is released and reunited with her family, leaving the police to tie up the case against the mysterious Loftus. Meecham, however, remains unconvinced of Loftus’ guilt, fearing that Mrs Hamilton has paid the loner to take the rap. As it turns out, Loftus is dying from leukaemia, so he has little to lose by standing in for the killer – quite the contrary in fact as his family would stand to gain financially from Mrs Hamilton’s payout. As he continues to investigate Loftus and the various connections to the case, Meecham becomes increasingly convinced that things are not as clear-cut as they might appear. Inch by inch, the view widens to include other individuals connected to Loftus: namely his devoted landlady, Mrs Hearst, and her husband, Jim; his alcoholic mother, Clara Loftus, a genuinely tragic figure; and his ex-wife, Birdie, no longer on the scene. Each character is drawn with care and attention, from the major influencers to the seemingly peripheral players in the mix. To reveal any more of the plot would almost certainly spoil some elements of the story, but suffice it to say that it remains suitably gripping and intriguing to the end. However, what really sets this mystery apart from others in the genre is the character development, aided by the attention to detail Millar brings to this aspect of the novel. Very few of these individuals are as straightforward or as ‘black-and-white’ as they might seem on the surface; instead, their personalities are nuanced with shades of grey and degrees of ambiguity that reflect a degree of reality. There’s a great deal of hard work and diligence in Meecham’s quest for the truth, qualities that reward his persistence in following up the loose ends. Millar also brings a strong sense of humanity to the lawyer’s character, an understanding of the harsh realities of life for some of the individuals involved. Moreover, there’s a lovely dynamic between Meecham and Alice Dwyer, Mrs Hamilton’s desirable young companion, almost reminiscent of a screwball comedy-romance at times, such is the nature of their pitch-perfect dialogue. The small-town atmosphere is nicely captured too, adding a sense of unease and darkness to the story, somethings that help to reflect the ‘feel’ of the place. In summary, this is a sharply plotted, absorbing mystery – ideal reading for the winter months. My thanks to John, who has been encouraging me to read this author for a while. Final note: As some of you may know, Margaret Millar was married to Kenneth Millar, aka Ross Macdonald, whose Lew Archer mysteries are amongst my favourite novels in the genre – I’ve written about some of them here. 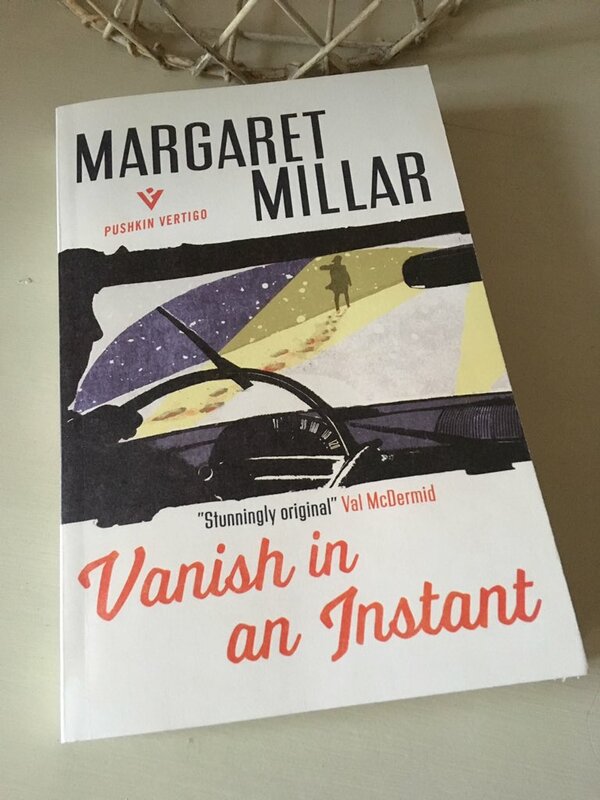 Vanish in an Instant is published by Pushkin Press; personal copy. This entry was posted in Book Reviews, Millar Margaret and tagged Book Review, Crime, Fiction, Margaret Millar, Noir, Pushkin Press, Pushkin Vertigo, Ross Macdonald, US on January 29, 2019 by JacquiWine. Regular readers may be aware of my fondness for Patricia Highsmith’s particular brand of domestic noir. Last year I read and loved Deep Water (1957), a novel which plays with readers’ responses towards an outwardly respectable man who secretly harbours psychopathic tendencies. It remains one of the highlights of my 2017 year in reading. 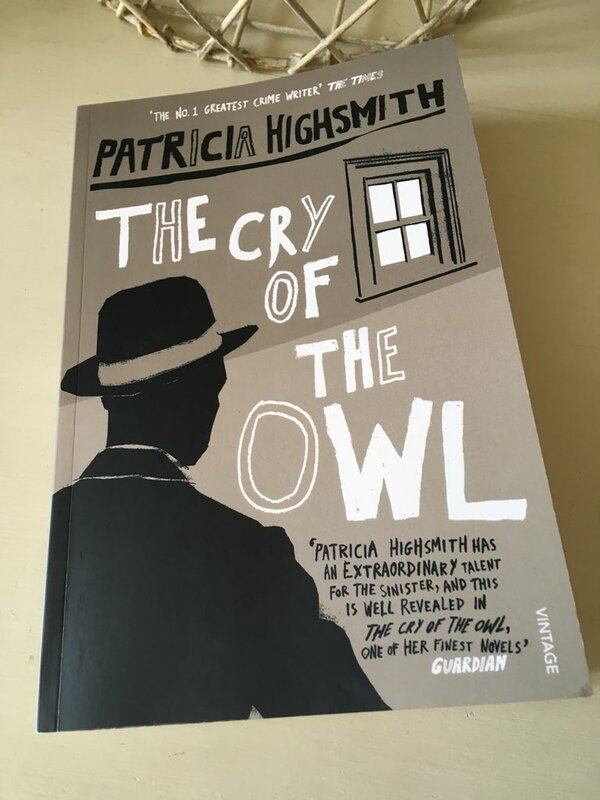 Highsmith’s interest in decency and morality comes to the fore again The Cry of the Owl (published a few years later in 1962), a book that seems to start off in traditional psychological thriller territory only to shift towards something a little more existential by the end. There is an underlying seam of bleakness here, a real sense of destruction and despair as the story edges closer to its denouement. In some ways, it reminded me a little of some of Georges Simenon’s work – his hard/psychological romains durs as opposed to his Maigret books. Either way, it’s an excellent book. Owl centres on Robert Forester, a twenty-nine-year-old man who has recently moved to a small town in Pennsylvania to escape the clutches of his venomous former partner, Nickie, a woman who continues to harangue him on the phone out of sheer malice. In spite of finding a decent job in the local aeronautics business, Robert has been battling loneliness and depression for some months – to the extent that he has slipped into the rather odd habit of watching an unknown young woman as she goes about her business at home. As the book opens, we find Robert observing the girl, Jenny, through her kitchen window as she lays the table and prepares an evening meal for two. While at first sight this situation may appear very creepy, Robert is not a stereotypical Peeping Tom. There is nothing sexual about his attraction to the girl; instead, he is merely seeking solace and comfort by watching her running through her domestic routine. It’s as if this picture of normality is giving Robert some kind of hope, a sense of grounding and purpose that he longs to recapture for himself. Even though Robert knows he is playing a potentially dangerous game here – Jenny clearly has a boyfriend who visits regularly – he finds it difficult to refrain from watching the girl at night. All too swiftly, of course, Jenny discovers Robert; but instead of feeling fearful for her safety, Jenny invites Robert into her home as she finds herself drawn to him in some strange and inexplicable way. Robert, for his part, feels somewhat embarrassed at being caught snooping around. Furthermore, there is a sense that getting to know the real Jenny would diminish in some way what her image has come to represent for him – a sense of calm and contentment and the absence of any kind of stress. Nevertheless, he continues to see Jenny, primarily at her rather insistent request. With each subsequent meeting, Jenny’s attachment to Robert seems to intensify. (In an almost reciprocal act to Robert’s earlier snooping, Jenny actually follows Robert to his new home – thereby the watcher effectively becomes the watched, if only momentarily.) As it turns out, Jenny is having significant doubts about the suitability of her fiancé, Greg, whom she does not love enough to marry. Consequently, she breaks off her engagement to Greg and continues to see Robert, who appears to be drifting into a relationship with her in spite of his better judgement. Meanwhile, the uber-possessive Greg is determined to track Robert down and warn him off Jenny, firm in the belief that he still has a chance to win her back. As he spies on Jenny and Robert at night, Greg’s temper and imagination start to run riot. Driven by the toxic Nickie, whose malicious opinions on Robert’s unhinged state of mind add fuel to the fire, Greg launches an attack on Robert near the local river, an incident which leads to a violent struggle between the two men. In the end, Robert has to drag Greg out of the water onto the river bank where he leaves him to recover. Unfortunately for our protagonist, Greg goes missing immediately after the fight, and suspicion naturally falls on Robert – seemingly the last person to have seen Greg alive. What follows is a veritable nightmare for Robert as his relatively ordered world comes crashing down around him. A sequence of increasingly twisted events ensues, acts which involve Robert, Jenny, Greg and Nickie – all of which leave the reader reeling from the catastrophic fallout. At first, it is natural to think that Robert is the odd character here; after all, his fondness for spying on Jenny is a little creepy. However, it soon becomes apparent that he might be the least imbalanced character in the book. Having lost her brother at a very young age, Jenny is rather preoccupied with the idea of death, a factor that plays a significant role in her response to the terrible events that unfold for Robert. Nickie is a very spiteful individual, prone to vindictive acts and outbursts, a characteristic typified by Robert’s recollections of the litany of complaints she unleashed on the night of their second anniversary. Her subsequent character assignations of Robert play a significant role in his downfall. Then there is Greg, a man who seems hell-bent on removing Robert from the equation – not just figuratively but literally too. In telling this story, Highsmith excels at capturing the rumours and gossip that circulate in a small-town community – the fears and suspicions that can surface as individuals who know some of those involved begin to put their own spin on events. Women like Mrs Van Vleet, Greg’s landlady and firm supporter. Ultimately though, what really makes this novel such a compelling read is the seemingly unstoppable chain of events that Robert’s relatively innocent search for solace kicks off. We are left with the sense of how powerless a man can feel when he his actions are judged and misinterpreted by the so-called upstanding citizens around him, especially when fate intervenes and plays her part to the full. Highly recommended for lovers of dark and twisted fiction. The Cry of the Owl is published by Vintage Books; personal copy. This entry was posted in Book Reviews, Highsmith Patricia and tagged #ReadWomen, Book Review, Classics Club, Crime, Fiction, Patricia Highsmith, US, Vintage Books on September 11, 2018 by JacquiWine. Something a little different from me today – a few thoughts on a couple of recent reads, both of which could be loosely classified as crime fiction. I really enjoyed this old-school spy mystery by the respected British writer Eric Ambler. (You can find my review of another of his books, the hugely entertaining crime caper Topkapi/The Light of Day, here). Like some of Ambler’s other novels, Epitaph for a Spy features a relatively ordinary if somewhat naïve man who, through no real fault of his own, finds himself caught up in a mysterious network of intrigue and illegal activities. The man in question here is Josef Vadassy, a languages teacher and Hungarian refugee of uncertain status, who gets into trouble while taking pictures during his holiday in the South of France. Luckily (or maybe unluckily) for our protagonist, the police soon come to the conclusion that Vadassy almost certainly didn’t take the incriminating photographs himself – he’s far too gauche for that. Instead, it seems likely that someone else has been spying on the naval defences, someone with an identical camera to Vadassy’s as the two pieces of equipment must have been switched at some point (probably by accident) – the most obvious cause of the issue being some kind of mix-up between cameras at Vadassy’s place of residence, the local hotel. So, Vadassy is sent back to the Réserve with strict instructions to follow the authorities’ orders in the hope of uncovering the real spy. Should he fail to do so, the outcome almost certainly means deportation for our protagonist, effectively destroying his whole world. Vadassy is supplied with a list of the hotel’s occupants to ‘investigate’ with a particular view to establishing details of any cameras in their possession – but the fun really starts when Vadassy decides to use his own somewhat misguided initiative to root out the culprit without arousing their suspicions. Among the guests at the hotel we have a typically British major and his mysterious wife, an idiosyncratic Frenchman who proves to be very indiscreet, and a young brother and sister combo from America who seem to have something to hide – I found this couple’s backstory rather hard to believe, but that’s a fairly minor quibble in the scheme of things. There are more potential suspects too, of varying European nationalities – twelve in total including the Swiss hotel manager and his wife. For the most part, the characters are interesting and well-drawn – I particularly liked Herr Schimler, a man who turns out to have had a very eventful past. There are a few red herrings along the way as Vadassy’s suspicions flit from one character to the next, all of which help to maintain engagement. All in all, this is a very enjoyable mystery with a clear resolution at the finish. In a sense, it becomes a race against time for Vadassy as he strives to flush out the spy before he is due back at work – both his job and his right to remain in France are at risk. In his review of this novel, Max describes the story as being akin to a classic country house crime novel, which seems like a very apt description to me. I read this novel over the sunny Bank Holiday weekend at the beginning of May, and it proved to be a fine choice. A nice match for the gorgeous weather. This is the third novel I’ve read by Hughes, a somewhat underrated American crime writer from the mid-20th century. My reviews of the other two are here – In a Lonely Place and Ride the Pink Horse – both of which I would strongly recommend, the former in particular. My comments on The Expendable Man are going to be fairly concise. Not because of any concerns about the quality of the novel – far from it, it’s actually extremely good! Rather, the less you know about it the better, especially if you think you might read it. In brief, the initial set-up is as follows. Hugh Densmore, a young doctor, has borrowed his mother’s Cadillac to drive from Los Angeles to Phoenix for a family wedding. En route, he spots a rather dishevelled teenage girl waiting alone on a deserted section of the highway. Densmore wouldn’t usually stop for hitchhikers – but in his concern for the girl’s safety, he offers her a ride which she accepts. From the word go, it’s clear that these two individuals come from very different social spheres; he is well-bred, educated and polite, while she is rough, brazen and resentful. After a tense and uncomfortable journey, Densmore drops the girl at a bus station and assumes he will never hear from or see her again. But then things go drastically wrong for our protagonist, and his previously ordered world comes crashing down around him. This is a brilliant story, one that may well cause you to question your own assumptions – and maybe expose some of your subconscious prejudices too. It’s also very gripping and beautifully written. Hughes has such a wonderful style; it’s a joy to read. Here’s how it opens. All in all, this is highly recommended – not just for lovers of crime fiction but for other readers too. 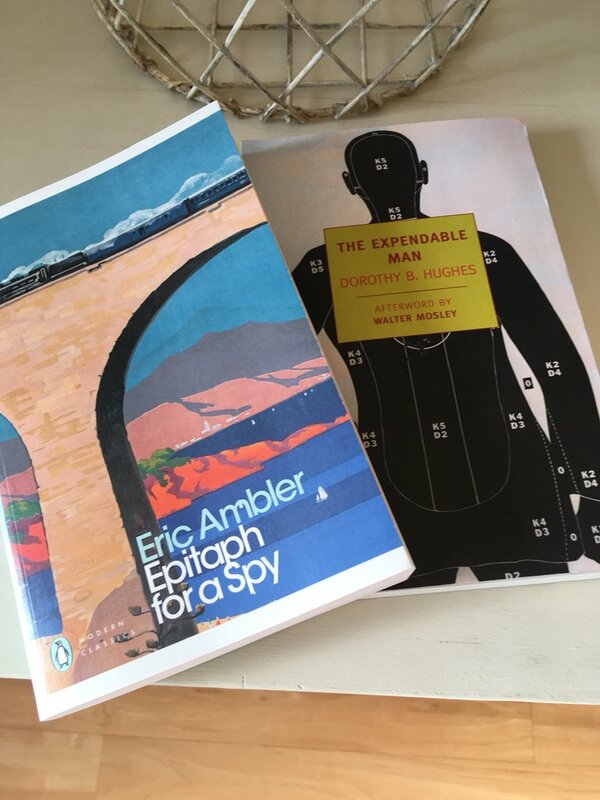 Epitaph for a Spy is published by Penguin, The Expendable Man is published by NYRB Classics – personal copies. This entry was posted in Ambler Eric, Book Reviews, Hughes Dorothy B. and tagged #ReadWomen, Book Group, Book Review, Classics Club, Crime, Dorothy B. Hughes, Eric Ambler, Hotels, NYRB Classics, Penguin Books, UK, US on June 19, 2018 by JacquiWine. As I’ve been off the grid for most of last few months, I didn’t get a chance to post a list of my favourite books from 2017. So, in the spirit of better late than never, here it is. Enjoy! Like its predecessor, 2017 turned out to be another strong reading year for me. I read fewer books than usual this time (around 70 books, mostly older/blacklisted titles) but the majority were very good. Once again, it proved very difficult to finalise a shortlist for this post, so I’ve gone overboard with a top fifteen – that’s two more than the baker’s dozen I usually aim for. These are the books I loved, the books that have stayed with me, the ones I’m most likely to recommend to other readers. I’ve summarised each one in this post, but you can read the full reviews by clicking on the appropriate links. It’s getting to the point where I need to reserve a permanent spot for Barbara Pym, such is the quality of her writing. This year’s slot goes to Crampton Hodnet, a delightful comedy of manners set in North Oxford in the late 1930s (Some Tame Gazelle came a very close second). What a joy it was to return to this author’s territory, a familiar world of charming curates, mildly ridiculous academics, amorous students and gossipy women. Probably the funniest Pym I’ve read to date. A series of six interlinked short stories/sketches inspired by Isherwood’s time in the city during the early 1930s. I really loved this book with its striking cast of characters and wealth of engaging vignettes. As one might expect, the author’s portrayal of a Berlin in flux is truly wonderful, capturing the atmosphere of everything from the seedy underground bars and nightlife to the magnificence and glory of the glamorous side of the city. A most evocative read. Here’s another author worthy of a permanent place my end-of-year lists, Elizabeth Taylor – I just can’t seem to get enough of her work. The storyline in this book revolves around Flora Quartermaine, a beautiful young woman who seems to have the perfect life. While Flora considers herself to be the very soul of kindness, in reality this is far from the truth, her best intentions often causing more harm than good. A novel full of little insights into various aspects of human behaviour – lovers of character-driven novels should enjoy this one. My favourite of the collections of short stories I read in 2017 (Saki’s Improper Stories came a close second). Yates’ canvases may be small and intimate, but the emotions he explores are universal. Here are the frustrations and disappointments of day-to-day life, the loneliness that stems from rejection, uncertainty or a deep feeling of worthlessness. Once again, this will appeal to lovers of character-driven fiction. A superb set of stories, quite varied in style in spite of the overriding theme. Set largely in the seedy bars and boarding houses of London’s Earl’s Court, Patrick Hamilton’s 1941 novel Hangover Square centres on the tortured existence of George Harvey Bone, a thirty-four-year-old man who is obsessed with a beautiful yet vindictive young woman named Netta Longdon. It is an utterly brilliant portrait of a man on the edge, perfectly capturing the sudden changes in mood and mindset of a lonely and tormented soul, driven to distraction by the heartless woman he so deeply desires. This might just be my favourite book of the year. A beautiful and compelling portrayal of forbidden love, characterised by Wharton’s trademark ability to expose the underhand workings of a repressive world. Set within the upper echelons of New York society in the 1870s, a culture that seems so refined on the surface, and yet so terribly brutal, hypocritical and intolerant underneath once the protective veneer of respectability is stripped away. There is a real sense of depth and subtlety in the characterisation here – classic literature doesn’t get much better than this. A highly compelling coming-of-age story set in Jerusalem during the closing stages of the Second World War. It’s a brilliant novel, one that features a most distinctive character quite unlike any other I’ve encountered either in literature or in life itself. In Miss Bohun, Manning has created a fascinating individual, one that is sure to generate strong opinions either way. Is she a manipulative hypocrite, determined to seize any opportunity and exploit it for her own personal gain? Or is she simply deluded, predominately acting on the belief that she is doing the morally upstanding thing in a changing and unstable world? You’ll have to read the book yourself to take a view. One of several reads featuring a highly distinctive female narrator – in this case, Sophia, a young woman who is looking back on her unhappy marriage to a rather feckless artist by the name of Charles. In writing this book, the British-born author Barbara Comyns has drawn heavily on her own life experience. It is, by all accounts, a lightly fictionalised version of her first marriage, a relationship characterised by tensions over money worries and various infidelities on her husband’s part. Although it took me a couple of chapters to fall into line with Sophia’s unassuming conversational style, I really warmed to her character, particularly as the true horror of her story became apparent. This is a wonderful book, by turns humorous, sad, shocking and heart-warming. Enchanted indeed! What a delightful novel this turned out to be – telling, as it does, the story of four very different English women who come together to rent a medieval castle on the Italian Riviera for the month of April. Without wishing to give away too much about the ending, this utterly charming story has a touch of the fairy tale about it as the lives of these four women are altered in various ways by their time at San Salvatore. A truly magical read, guaranteed to lift the spirits. In this beautifully written novel, we follow a day in the life of the Marshalls, an upper-middle-class family struggling to find a new way to live in an England irrevocably altered by the Second World War. Several threads and encounters come together to form a vivid picture of a nation, a country trying to come to terms with new ways of life and the accompanying changes to its social fabric. A little like a cross between Woolf’s Mrs Dalloway and an Elizabeth Taylor novel, this was a wonderful discovery for me. This novel was published in 1957, two years after The Talented Mr Ripley with which it shares a focus on the psychological – in other words, the motives that drive certain individuals to behave in very sinister ways. Once again, Highsmith encourages us to side with an outwardly respectable man who secretly harbours psychopathic tendencies. The way she does this is so clever; she knows exactly how her readers will respond to each of her characters, thereby creating a situation where we feel sympathy for a murderer and contempt for the woman who has made his life so difficult. A thoroughly delicious read. I read this in advance of Halloween, and it proved to be a highly appropriate read for the season – atmospheric, unsettling and at times quite humorous in a darkly comic way. What really sets this book apart from so many others is its highly distinctive style, much of which stems from the curious nature of the narrator’s voice, that of young Merricat Blackwood. A novella with much to say about our suspicions, our prejudices and, perhaps most importantly of all, our treatment of people who seem strange or different from ourselves. The sense of being an outsider – or society’s mistreatment of the outsider – is a prominent theme. Several of the books in translation I chose to read in 2017 were disappointing, but this one really stood out for the distinctiveness of its central character, Doris. A striking young woman whose voice I found utterly engaging right from the very start, particularly in the way it reflected her complex personality – a glorious mix of the naïve and the streetwise, the vivacious and the vulnerable. Reputedly inspired by Anita Loos’ Gentleman Prefer Blondes, Keun set out to write a response from the German perspective, one that ultimately shows us the darker side of life which lies beneath the glamour of the capital city, Berlin. Another very evocative read for me. Set on an Oxfordshire country estate in the autumn of 1913, The Shooting Party provides a terrific insight into the dying days of the Edwardian era, the beginning of the end of a time-honoured way of life for the English upper classes. Essentially a tale of ‘upstairs and downstairs’, this is a wonderful ensemble piece with a sting in its tail. Fans of L. P Hartley’s The Go-Between will likely enjoy this one. Dorothy B. Hughes made my 2016 highlights with her classic noir novel In a Lonely Place, the story of a damaged ex-Air Force pilot named Dix Steele. And here she is again in 2017, this time with the existential noir Ride the Pink Horse. Written in a tough, hardbitten style, Pink Horse is a slow burn tale of pursuit, the tough, streetwise guy who comes looking for a final payoff from his former boss before hightailing it to Mexico and the life he envisages there – only things don’t quite go to plan. It’s probably my favourite of the dozen or so crime novels I read last year. 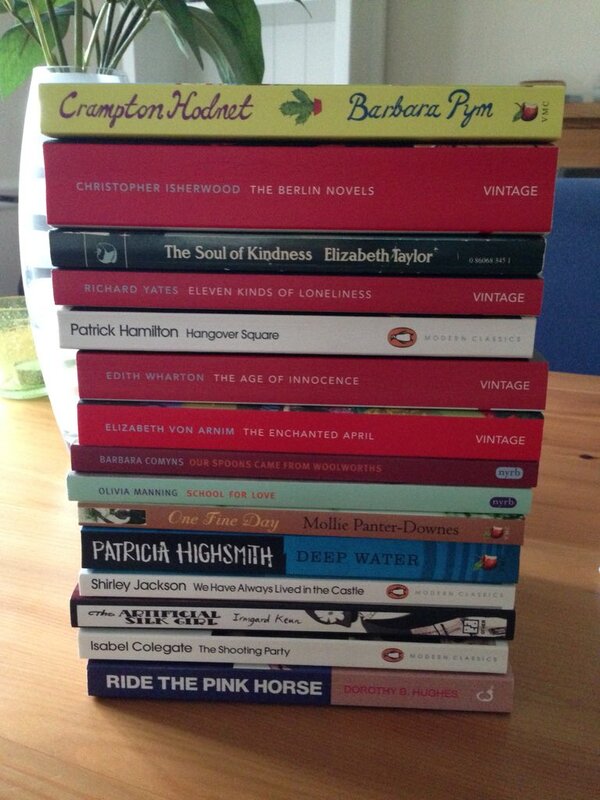 So there we are – a pretty satisfying year of reading all told. This entry was posted in Book Reviews, Books of the Year and tagged #ReadWomen, #TranslationThurs, Barbara Comyns, Barbara Pym, Book Review, Books of the Year, Canongate Crime, Christopher Isherwood, Crime, Dorothy B. Hughes, Edith Wharton, Elizabeth Taylor, Elizabeth von Arnim, Fiction, Highsmith, Irmgard Keun, Isabel Colegate, Kathie von Ankum, Literature in Translation, Manning, Mollie Panter-Downes, Noir, NYRB Classics, Other Press, Patrick Hamilton, Penguin Books, Penguin Modern Classics, Richard Yates, Shirley Jackson, Short Stories, Vintage Books, Virago, Virago Modern Classics on May 1, 2018 by JacquiWine. Last year Dorothy B. Hughes made my end-of-year highlights with her classic noir novel In a Lonely Place, the story of a damaged ex-Air Force pilot named Dix Steele. There’s a good chance she’ll make the list again in 2017, this time with the existential noir Ride the Pink Horse. Written in a tough, hardbitten style, Pink Horse was published in 1946, the year before Lonely Place. It’s a slow burn tale of pursuit, the tough, streetwise guy who comes looking for a final payoff from his former boss before hightailing it to Mexico and the life he envisages there. I think it’s my favourite of the dozen or so crime novels I’ve read this year. The novel focuses on Sailor, a former street kid turned city slicker who has travelled to a ‘hick town’ near the US border with Mexico in search of the main man, a corrupt state Senator referred to here as ‘the Sen’. While the Sen believes he has finished with Sailor, our protagonist definitely hasn’t finished with Sen. According to Sailor, the Sen owes him a sizeable bundle of money, the remaining payment for a murder that didn’t quite go to plan – and if the Sen refuses to pay up, Sailor thinks he has enough knowledge of what really happened to pin the rap on the Sen. When he gets what’s due to him, Sailor plans to cross the border into Mexico. Once there, he can set up a little business peddling liquor or suchlike, maybe even find a beautiful girl, a silvery blonde with clear, shimmering eyes. All he has to do is to find the Sen and shake him down. The trouble is, it’s Labor Day weekend, and the town is packed full of people, all there to celebrate the Fiesta. When he arrives on the bus from Chicago, dirty, sweaty and in need of a wash, Sailor is frustrated to discover that all the local hotels are full (even the crummiest ones), leaving him no other option but to bunk down on the ground for the night. Nevertheless, he soon discovers that the Sen is holed up in the smartest hotel in town, the swanky La Fonda complete with its plush bar and fancy restaurant. And so the quest begins, as Sailor confronts the Sen and pushes for his payoff. At first, the Sen is elusive, playing for time while he considers his options. But Sailor is determined; he knows what’s due to him, and he’s out to get it. To complicate matters further for Sailor, there’s another significant player in the mix – McIntyre (aka ‘Mac’), a Chicago-based cop and long-time acquaintance of Sailor’s, who also happens to be in town, allegedly for the Fiesta. Mac is the wise, down-to-earth type, someone who watches and waits and plays his cards fairly close to his chest. At first, Sailor thinks Mac is trailing the Sen; but as the weekend unfolds, it becomes clear that Mac is keeping tabs on Sailor too, a dynamic that adds another layer of tension to the situation, certainly as far as Sailor is concerned. Hughes makes good use of the animated backdrop of the Fiesta, complete with its mix of Spanish, Indian and gringo revellers, thereby conveying the frenetic atmosphere in the local bars and streets. (As one might expect, the novel’s language and racial descriptors reflect the prevailing attitudes of the day.) There are times when Sailor feels caught in a labyrinth, an encircling trap from which there appears to be no escape – a feeling that is reflected in the rather circular nature of the chase as Sailor tries to get what he desires from the Sen. The streets were whirling louder, faster; on the bandstand a fat black-haired singer blasted the microphones and the crowds screamed ‘Hola! Hola!’ as if it were good. A running child with remnants of pink ice cream glued on his dirty face bumped into Sailor’s legs, wiped his sticky hands there. Sailor snarled, ‘Get out of my way,’ a balloon popped behind him and the kid who held the denuded stick squalled. On the face of it, the Fiesta appears to be gay and jolly, a time for release and celebration; but below the surface glamour lurks a much darker undercurrent, a terrible note of death and destruction, a hangover from the days of previous crimes against humanity. As the story unfolds, we learn more about Sailor and his troubled childhood – in particular, his abusive, alcoholic father, downtrodden mother and the impact of poverty on his formative years. There are echoes of the past here, sights that trigger memories of desperate times and circumstances, things that Sailor would much rather forget. Perhaps unsurprisingly, Hughes also excels at capturing the inherent sense of loneliness and alienation that Sailor is experiencing. It’s a quality that also underscores her portrait of Dix Steele, the lone wolf protagonist in her brilliant novel, In a Lonely Place. The Sen, on the other hand, emerges as a sly, shadowy figure, a somewhat elusive presence. He is the one who first spotted young Sailor’s talents at the pool hall all those years ago and subsequently groomed him for a key role in his organisation. As the weekend plays out, it becomes increasingly clear how hard it will be for Sailor to carve out a new life for himself given the nature of what he’s attempting to pull off. There are various points in the story when he could choose to do the right thing, to set himself on a better track for the future – to find out if he decides to take any of these opportunities, you’ll have to read the book. Mac, an honest and decent man at heart, is keen to help Sailor – if only Sailor would agree to talk to him about what really happened on the night of the murder. (In another life, Mac knows that he could have ended up like Sailor, and vice versa, the two men having grown up not far from one another in the same rugged neighbourhood.) Another possibility for redemption comes in the form of old Pancho, the kindly man in charge of the battered fairground carousel, who takes Sailor under his wing, offering him tequila and a blanket for the night while also trying to set him on a straighter path. Ride the Pink Horse is an excellent noir, one that highlights the existential nature of our existence, how our lives and destinies are largely shaped by our own choices and actions. The title refers to the coloured wooden horses on Pancho’s shabby merry-go-round. It could also be viewed as a metaphor for life itself, e.g. the ups and downs that we all experience as we make our way from the cradle to the grave or a few minutes of enjoyment in which we can forget all our troubles. Either way, it’s an apt title. There’s a film too, directed by and starring Robert Montgomery. I’m hoping to track it down fairly soon. 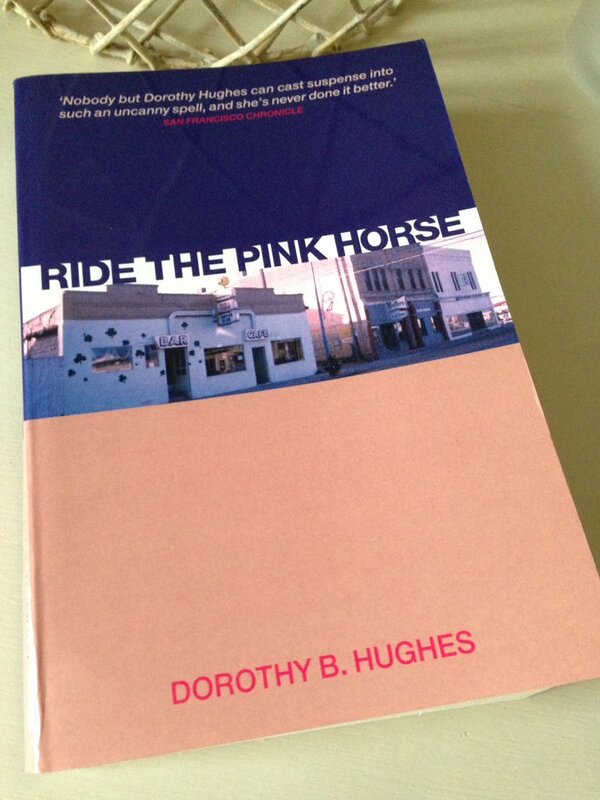 Ride the Pink Horse was published by Canongate Crime; personal copy. This entry was posted in Book Reviews, Hughes Dorothy B. and tagged #ReadWomen, Book Review, Canongate, Canongate Crime, Classics Club, Crime, Dorothy B. Hughes, Fiction, Hotels, Noir, US on December 5, 2017 by JacquiWine. Earlier this year, I read and loved Bird in a Cage, a devilishly clever noir by the French writer Frédéric Dard. Originally published in 1956, The Executioner Weeps is my second Dard – and thankfully it’s just as intriguing as the first. The novella is narrated by native Frenchman Daniel Mermet, a moderately successful artist who has travelled to a seaside town near Barcelona for a holiday. One night, as Daniel is driving alone in a remote part of the Spanish countryside, a beautiful young woman steps out of nowhere in front of his car – Daniel is travelling too fast to stop, so he hits the woman, crushing her violin case in the process. The incident marks a turning point in Daniel’s life, the full significance of which only becomes apparent much later in the story. Nevertheless, there is a sense of foreboding right from the start, particularly in the series of thoughts that flash through Daniel’s mind in the seconds before impact. Believing the woman to be largely unharmed, Daniel decides to take her back to his motel where she can rest for the night – and besides, as he doesn’t speak the local language, involving the authorities at this stage might turn out to be problematic. When the woman wakes up the next morning, it becomes clear that she is suffering from a case of amnesia – her knowledge of a past or present life is non-existent. In the absence of any formal papers, the only clues to her identity are a handkerchief embroidered with the letter ‘M’ and her clothes which carry the label of a dressmaker based in Saint-Germain-en-Laye, a suburb of Paris. In an effort to help the woman uncover her background, Daniel contacts the French consul and the local police, but neither seems interested in pursuing the case. After all, there’s nothing to prove that she is definitely a French citizen or a missing person – and if her family are worried, surely they will initiate any necessary enquiries themselves? Meanwhile, Daniel finds himself falling in love with this sweet-natured woman who by now has developed an affinity with the name ‘Marianne’. As their relationship blossoms, the couple spend long lazy days together in the idyllic surroundings of Castelldefels, enjoying the pleasure of one another’s company as they live their lives in the moment – so much so that Daniel begins to dread someone coming along in search of Marianne as this would almost certainly bring an end to his happiness. To Daniel, Marianne represents beauty and purity, qualities he hopes to capture in her portrait which he sets out to paint. Nevertheless, while the finished painting is a technical success, there is something rather unnerving about it. Albeit subconsciously, Daniel’s brushstrokes have revealed a curious look in Marianne’s eye, a sinister glint that seems to hint at some unknown element in her personality. Much as Daniel would like to remain in a secluded dream world with Marianne, two things come together to force his hand. Firstly, he hears that his work is to be exhibited in the US, a development that will require him to travel to the country in question to support the event. If he is to attend, then Marianne must come too – but without a confirmed identity, how on earth will she be able to travel? Secondly, and perhaps most significantly, Daniel finds that he cannot separate himself from the mystery of Marianne’s past, especially once certain clues about this period start to emerge. In particular, he is haunted by some unanswered questions about his lover’s former life. Why did Marianne appear to throw herself at his car that night on the road? Who or what was she trying to escape from? With the fear of the unknown gnawing away his heart, Daniel decides to travel to Saint-Germain-en-Laye in the hope of uncovering the truth for himself. What he finds there is truly devastating, both shocking and heartbreaking – so much so that he is forced to see Marianne in a completely different light. The Executioner Weeps is both a dark mystery and an intriguing love story, the two strands coming together to form a highly compelling whole. Like Bird in a Cage, it is another of Dard’s ‘novels of the night’, an unsettling noir with a distinct psychological edge – the pace really steps up a gear in the final third as the net starts to close in on Daniel’s world. Stylistically this is a beautifully-written book, shot through with an undeniable sense of tragedy and loss, a quality that adds a touch of poignancy to the noirish tone. In essence, Daniel is caught between his desire to cling on to his idealised vision of Marianne – an image typified by her apparent tenderness and beauty – and his fear of having to confront the emerging darkness in her past. I’ll finish with a final quote from a relatively early point in the novella, one that hints at some of the unsettling developments to come – Daniel is just about to paint Marianne’s picture for the first time. This is my contribution to Richard’s Literature of Doom event – now extended to cover French ‘Doom’ as well as the Argentinian and Russian varieties. Guy has also reviewed this book here. 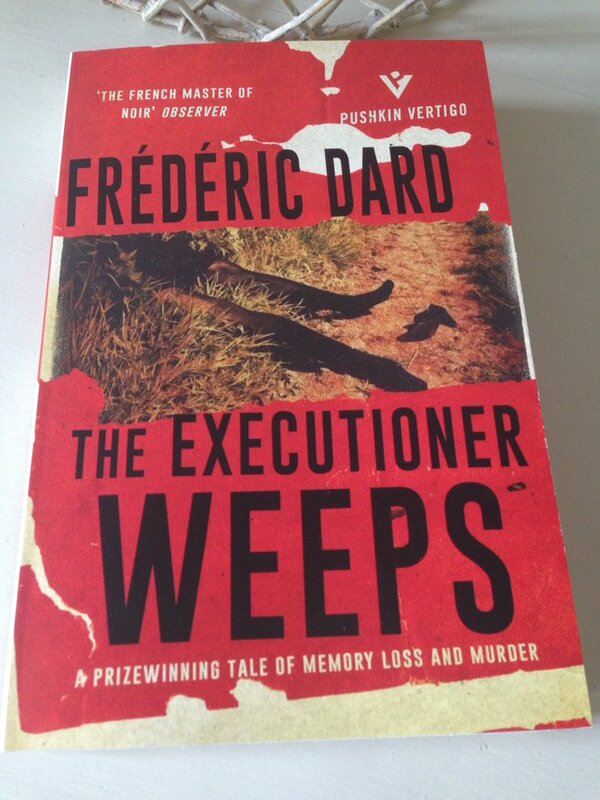 The Executioner Weeps is published by Pushkin Press; my thanks to the publishers for kindly providing a review copy. This entry was posted in Book Reviews, Dard Frédéric and tagged #TranslationThurs, Book Review, Classics Club, Crime, David Coward, Fiction, France, Frédéric Dard, Literature in Translation, Noir, Pushkin Press, Pushkin Vertigo on November 14, 2017 by JacquiWine. Like many other readers, I often find myself drawn to stories that take place on trains. There is something very appealing about this type of setting for a novel. Perhaps it’s the relatively intimate, self-contained nature of train compartments, an environment conducive to chance encounters and secret assignations. Maybe it’s the mix of people we brush up against during the journey, a disparate group of individuals, each with their own characteristics and idiosyncrasies. Or could it be the sense of continuous momentum involved, a feeling of journeying into the unknown whatever this may bring? In reality, I suspect it’s a combination of several factors – whatever it is, I find these stories hard to resist, especially if there’s a crime involved. 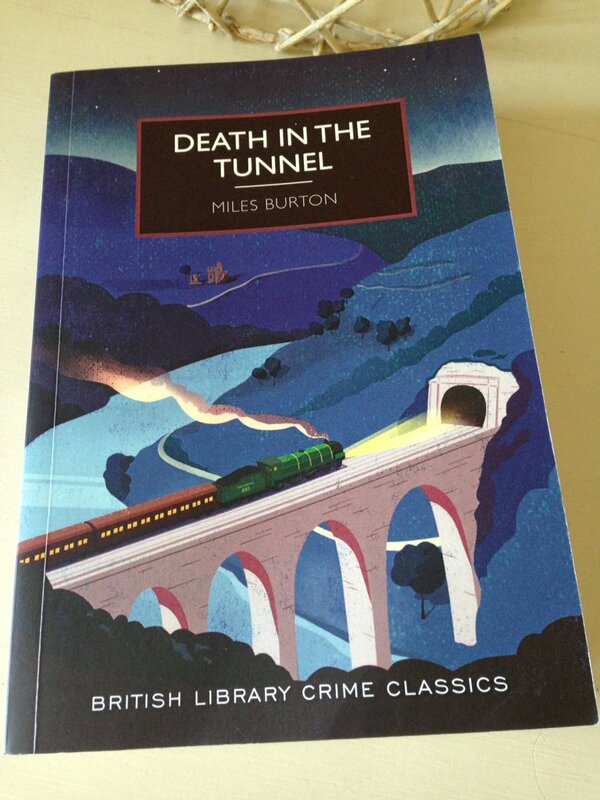 All of which brings me to Miles Burton’s 1936 novel, Death in the Tunnel, a Golden Age mystery featuring a highly suspicious incident that takes place during a train journey. As the novel opens, the 5 pm train from London’s Cannon Street is travelling to Stourford via its usual route. A little while after the train enters the Blackdown Tunnel, the train driver suddenly applies the breaks, causing the guard to commence a check of all the compartments to see if there has been an emergency on board. Shortly afterwards, the train begins to gather speed again, arousing the guard’s curiosity even further. As it turns out, the driver had seen a red light swinging in the middle of the tunnel, only for the light to change to green as the train slowed down and approached the source – a most peculiar occurrence, especially given the absence of any scheduled works on the line. Then, just as the train is pulling into Stourford, the guard discovers a passenger who seems to be in a bad way. On closer inspection at the station, it would appear that the man in question is in fact dead. At first sight, Sir Wilfred’s death appears to be a cut-and-dried case of suicide. On his arrival at the platform at Cannon Street station, Sir Wilfred had paid the guard a pound to be seated alone in a locked first-class compartment where he wouldn’t be disturbed during the trip home. A small pistol engraved with his initials was found close to the body in a position that would fit with the presumption of suicide. Furthermore, it transpires that Sir Wilfred’s son and daughter were out of the country at the time of his death – both had gone abroad at their father’s suggestion, possibly to spare their feelings over the nature of his death. Nevertheless, clear cut or not, it is always best to be thorough in these matters, and Inspector Arnold of Scotland Yard is soon called in to take charge of enquiries. Inspector Arnold doesn’t waste any time in getting down to business on the case, interviewing associates of Sir Wilfred’s and examining all the available evidence in a structured, methodical manner. In this endeavour, he is ably assisted by his close friend, the amateur detective, Desmond Merrion. As the pair begin to delve more deeply into the circumstances surrounding Sir Wilfred’s death, a number of puzzling details start to emerge, some of which suggest the possibility of murder as opposed to suicide. For instance, why was there no train ticket amongst Sir Wilfred’s belongings when the train compartment was searched? Who was the man seen leaving one of the first-class compartments just before the train entered the tunnel and where did he go? And perhaps most perplexing of all, who was operating the red and green lights seen by the driver as he travelled through the tunnel? On pondering the latter, Merrion begins to develop a hypothesis, one that raises several questions that prove rather tricky to answer. “…However, let’s admit the bare possibility of there having been a man in the tunnel, who deliberately slowed down the train so that he would be able to board it. By the way, this theory of Merrion’s doesn’t turn out to be true, but it does get the ball rolling on the pattern of the book – particularly the continual emergence of mysterious details and the development of various hypotheses, all of which point towards the possible murder of Sir Wilfred. And besides, those individuals who knew Sir Wilfred well can think of no reason why he would have committed suicide – the man had no business or money worries to speak of, so why would he have killed himself? By contrast, Sir Wilfred’s rather stubborn manner and his occasional lack of mercy in passing judgements as a Magistrate meant that he might have made a number of enemies over the years. As such, murder would appear to be a distinct possibility. Death in the Tunnel is a mystery where the focus is on ‘who’ and ‘how’ as opposed to ‘why’. Burton is not particularly interested in exploring the psychology behind the crime, the perpetrator’s reasons for his or her actions. What’s key here is solving the intricate puzzle of how the murder was committed and by whom. In this regard, Death in the Tunnel is a very effective little puzzler, packed full of clues and a sprinkling of red herrings along the way. Inspector Arnold and Desmond Merrion work perfectly well together as a team, their skills complementing one another very effectively. While Arnold tries to focus on the evidence and known facts, Merrion uses his highly developed powers of imagination and lateral thinking to develop possible scenarios as to what might have happened on the day. The combination of these talents is the key to the pair’s success. The final solution to the puzzle is rather intricate if a little convoluted in the end. Nevertheless, this turned out to be a most enjoyable read, a gentle vintage mystery in keeping with the style of the British Library Crime Classics collection. Guy has also reviewed this book – you can find his post here. This entry was posted in Book Reviews, Burton Miles and tagged Book Review, British Library Crime Classics, Classics Club, Crime, Fiction, Miles Burton, UK on September 26, 2017 by JacquiWine.